Packing up camp this morning and heading out before 5am. I made it through Hayden Valley, stopping occasionally to look & listen with nothing interesting. 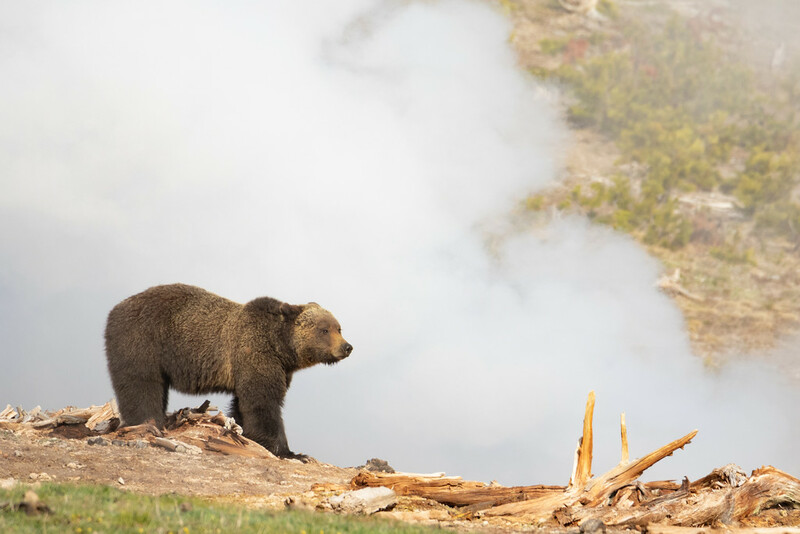 Just south of Mud Volcano, there was a grizzly bear peeking out over the hillside. It was still pretty early (that photo was ISO-6400). But I found my spot. I was sitting there alone for a while before a couple more cars stopped. When the sun started shining on the tallest trees, it looked to be a good photo moment. Then for reasons I’ll never understand, two groups of people (typical ~600mm f/4 setups) LEFT like 15 minutes before the sunrise hit the bear. 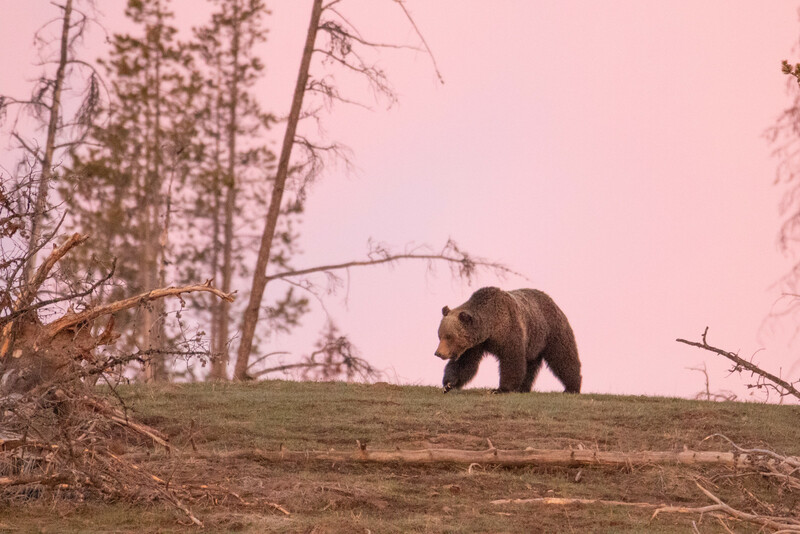 People in the park have networks of sources so they probably got word of something happening elsewhere, but I don’t know what they were searching that tops a grizzly bear @ sunrise. Soon after clouds rolled in and took the golden light away, so I decided to also move on. 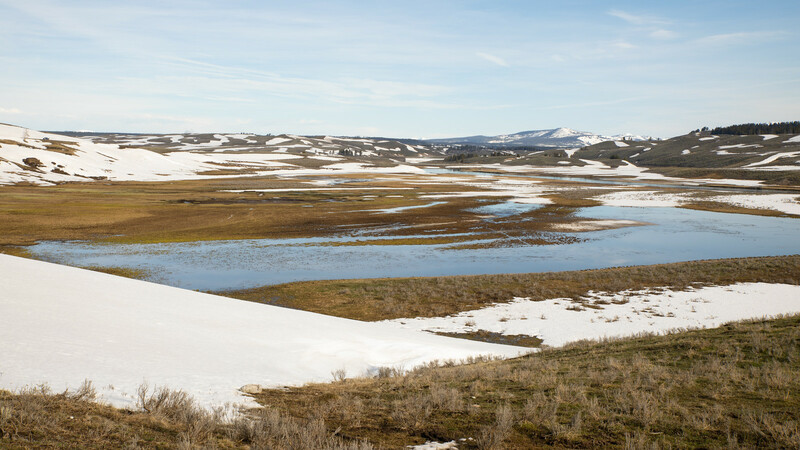 Hayden Valley honestly has less snow than I thought. Figured everything would still be buried over the sagebrush, but it’s reduced to snowfields peppering the landscape. 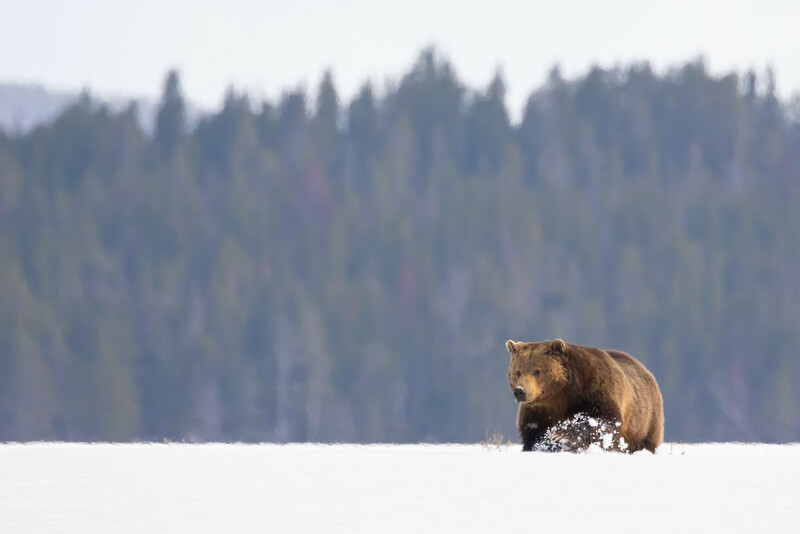 Back at Mud Volcano, the bear moved on to the thermal area. Eventually moving up and over the hillside, following the boardwalk loop. Hopefully nobody is back there! 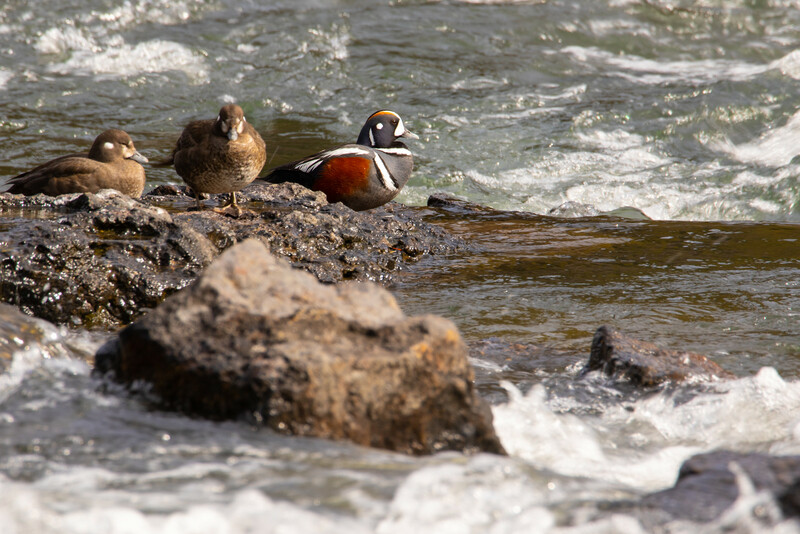 Trending south now to LeHardy Rapids, where the harlequin ducks are out. Bridge Bay Marina is still partially frozen, and there is several feet of snow at Bridge Bay CG. The roads and site pull-ins are plowed, but pitching a tent may be difficult when it opens in a couple weeks. The rest of the morning was spent wandering and checking on the two Canyon carcasses. 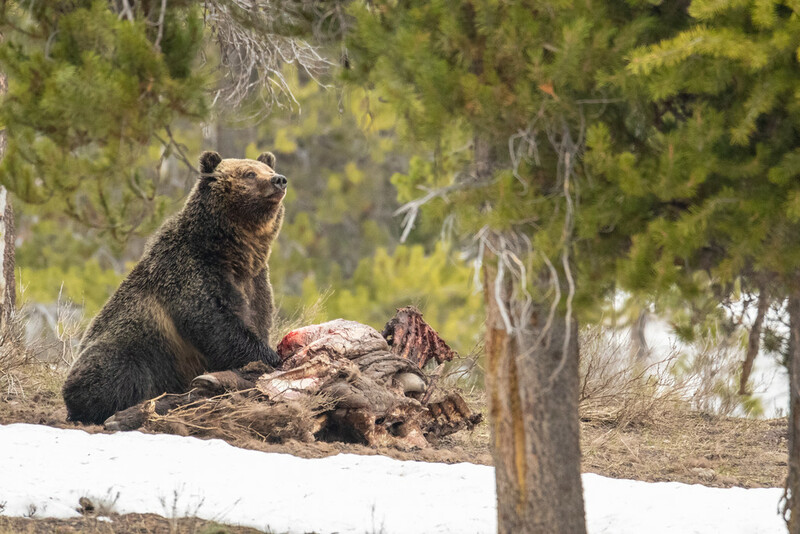 I heard that the bison carcass had a bear & wolf on it early in the morning, but it’s looking to the east of the road – made a note to stake that spot out in the evening when the lighting is better. After a coffee refill, I went back to Grizzly Overlook to chat with some friends. Nothing otherwise interesting was going on. 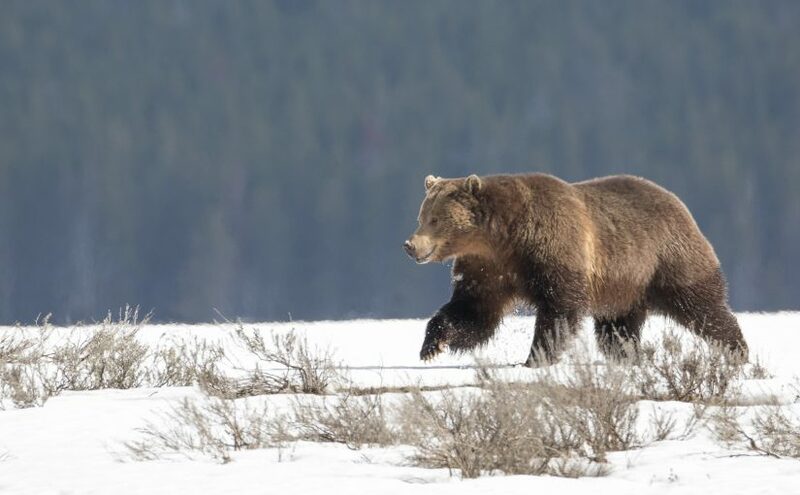 Later in the afternoon, a grizzly bear was spotted near Alum Creek. After looking at the photos, it looks like the same bear from Mud Volcano that morning. He’s really covering some ground if that’s the case. The bear continues on crossing the road and then the river moving towards Canyon at a pretty good pace. 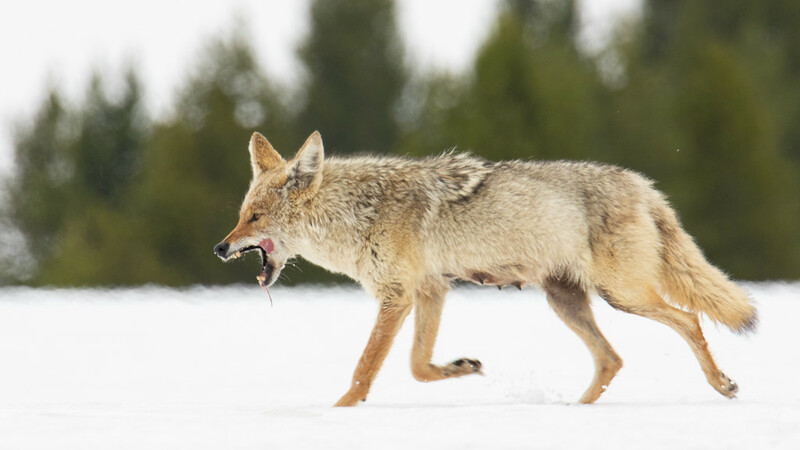 Back at the carcass sites, a coyote was just leaving. Then it’s back to scouting hotspots until later that evening. The park doesn’t seem to be busy enough to claim a turnout for the evening. On a particular pass by the bison carcass, there was clearly activity judging by the number of cars, but still plenty of parking available. It’s a bear. Probably the same one given the direction it was heading (and a couple hours passed since the river crossing). The bear left shortly before sunset to end the day. Thanks Tori! 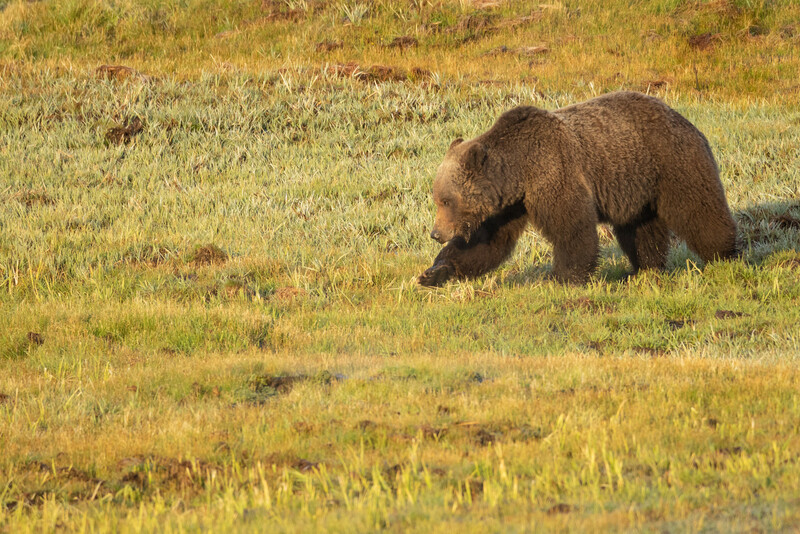 Yeah, the bear pics are 600mm and most are cropped in even further.